After enjoying breakfast, we gathered for the first plenary session of the day, Claudia Johnson speaking on “Conjuring Jane Austen.” The listed title was “Can We Ever Have Enough of Jane Austen?”, which was a subject Dr. Johnson covered as well. Her talk was as fascinating as anticipated, scholarly yet witty, and now I’m really looking forward to her upcoming book on Janeites. One comment she made that I really liked was, though she found the most recent films “uninspired,” she still thought that one cannot have enough of Jane Austen, as those movies were not really Jane Austen at all. Hear, hear! I skipped the next breakout session to prepare for my poster session, “Blogging Jane; or, Blog Snarkily and Carry a Big Cluebat.” What is a poster session? Simply it is several large corkboards set up around the room, and each of us who were presenting set up our stuff and talked about it to those who stopped by. Lorna helped me set up, and then I waited for the rush. I wasn’t sure what to expect, but it was great. Most of the people had at least heard of the blog, and even those who didn’t were kind and interested. I also had so many Gentle Readers stop by and introduce themselves, including some who whispered, “I just lurk.” The best thing some of them said was, “I found out about a book, or a play, or something else I enjoyed from AustenBlog.” That’s the best thing I could ever hear. The LOLAustens were especially popular. At one point the crowd around me was so thick I was holding three or four conversations at once. It was great but I was hoarse and worn out by the time it was over two hours later! I ran off to the next breakout, Janine Barchas on Elizabeth Gaskell’s North and South and how it is almost a reaction to Pride and Prejudice, pointing out the north/south divide in P&P as well as in N&S. The next plenary session was also much-anticipated, Joan Ray on “Jane Austen for Smarties,” obviously a play on the title of her book, Jane Austen for Dummies. Anyone who has had the opportunity to hear her knows that Joan is an extremely entertaining speaker, and she did not disappoint. 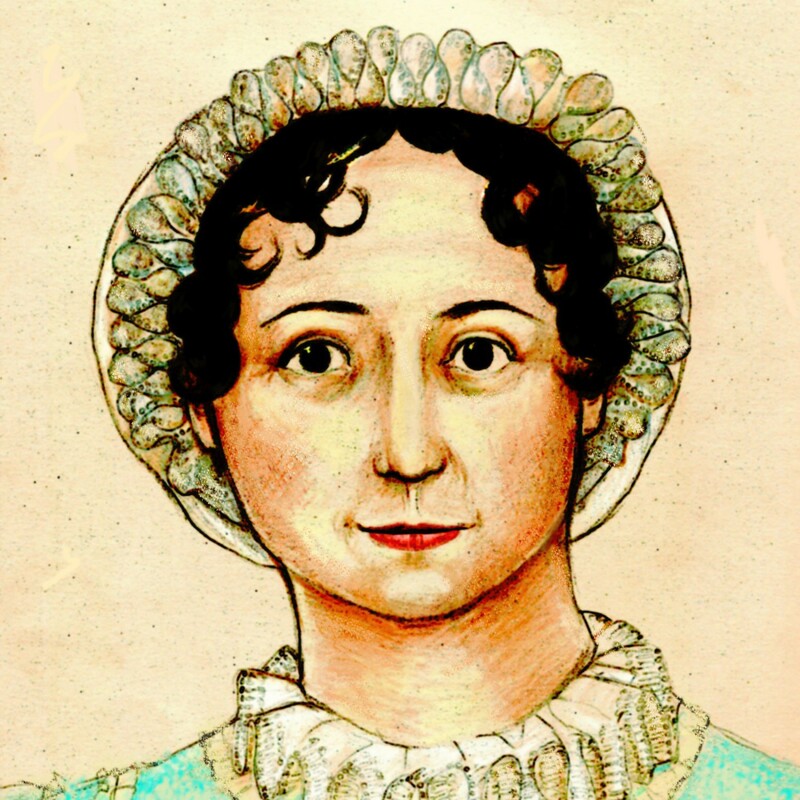 She donned surgical scrubs and doctor’s lab coat (with her name and “Doctor of Austenology” embroidered on them) and used the children’s game Operation as a metaphor for creating the perfect Janeite. She highlighted early enthusiasts and scholars of Austen’s work–and even some early detractors (there were others besides Mark Twain). We can’t wait for her next work, either: the Jane Austen entry in Gale’s Dictionary of Literary Biography. One more breakout, Jane Spector Davis on Harry Potter and Jane Austen, comparing and constrasting Emma with Prisoner of Azkaban, sent us off to prepare for the banquet and ball. Lorna and I both wore our Regency kits, so it took a while longer than usual, but soon we were dressed and ready to go. First we went to the author signing and cocktail party, got some books signed, and admired all the costumes. There were more people than ever dressed in Regency costumes this year, including gentlemen. I’m not sure if that is because it’s becoming more popular or because the AGM Steering Committee arranged for attendees to rent costumes, which were dropped off and picked up at the hotel, making it easy for those who have no Regency kit in their closets. We went in to dinner, which was delicious and enjoyed in “the company of clever, well-informed people, who have a great deal of conversation”–indeed the best company. After dinner, those of us in costume (probably 150-200 people), led by a bagpiper, paraded up Michigan Avenue and around the block, to the great bemusement of Chicago in general. We waved grandly to cars stopped at red lights and random tourists snapping photos of the crazy people; at one point (I was told) a bicycle messenger was yelling into his cell phone, “You won’t BELIEVE what I’m looking at!” I wonder if it was the same handsome young man on a bicycle who, clearly enjoying the spectacle, called out that the Duke of Nottingham was available once again. We “ooooohed” at him, which he seemed to like. Many people asked us what was going on. They heard “Jane Austen” and said “OOOHHHHHHH.” The universal passport: Jane’s name! It was hilarious and so much fun! When we returned to the hotel, the bagpiper had squeezed himself into an alcove, wishing (he told me) to be out of the way, but the ladies immediately queued up to have their photo taken with him. The power of the kilt! We then repaired to the ballroom, where the dance floor had been laid and the musicians warming up for the ball! Each dance was demonstrated by experienced country dancers, who then dispersed among the crowd, inviting some of us to dance and helping us along. We were walked through each dance (and many of us had already practiced them in the dance classes) and of course there was some confusion and collisions and trains (and probably feet) tread upon, but it was still the most fun I’ve had in a long time. My fan came in handy as more than a prop, however. At midnight, I turned into a pumpkin (not really) and the ball was over, whereupon we stumbled off to bed, footsore and sweaty and smiling. We can see why Jane Austen, and her characters, enjoyed dancing so much! Sorry about the lack of reportage. I really should have known that it would be difficult to do. There was free wifi in the lobby of the hotel, but when I wanted to post was late at night when I was in bed in my jammies, so that didn’t really work out, and the in-room wifi fees were, I felt, exorbitant. That being said, George the Eee PC and I got along very well and I was glad I took him along! He hardly took up any room, after all. I’ll do my best now to wrap up Friday, Saturday, and Sunday. Friday started with a country dancing lesson, at which we learned several dances that we would be dancing at the ball on Saturday night, including everyone’s favorite, Mr. Beveridge’s Maggot. Even if you’re not a P&P95 fan, it’s really a fun (and complicated!) dance. Maybe it’s fun because it’s so complicated–you really feel accomplished if you can dance it! Afterwards some of us were complaining that it was hot and we were sweaty, and someone else said, “Horses sweat, men perspire, women merely glow.” I said, “Then I’m glowing like a horse!” Good exercise! I cleaned up a little and went to the first poster session, which was in the same room as the Regency Emporium. Did a bit *cough* of shopping. Then I met some friends for lunch in the hotel restaurant, as some other lunch plans had been canceled at the last minute, and we squeed over each other’s purchases. After lunch, we returned to the Regency Emporium and bought more stuff. 🙂 My big score was a Jane Austen watch! The AGM officially opened with the first plenary session, a panel discussion including Inger Sigrun Brodey, Gillian Dow, Paula Marantz Cohen, and Peter Graham. They talked about Jane Austen’s legacy in their own work. My favorite bit was Gillian talking about an early French translation of Sense and Sensibility from about 1815. The translator decided it needed some fixing up. (Sound familiar?) Marianne became “Maria” (a more English-sounding name). Willoughby’s wife was killed in a carriage accident, and he wrote to Elinor and asked if “Maria” would marry him. Elinor read the letter to “Maria” and Brandon, whereupon “Maria” threw herself upon Brandon and said, “There’s only one man for me!” There was much “ewwwww”-ing in the audience. And they said Lost in Austen was so clever and original! For the first breakout session, I went to a presentation by Carol Pippen and Nancy Magnuson of Goucher College about Alberta and Henry Burke and their amazing collection of Austeniana, which they bequeathed to the Goucher College Library. I have a continuing fascination with the collection, so it was great to learn more about Mrs. Burke as well as her husband Henry, who was one of the founders of JASNA. For the second breakout session, I chose Edith Lank’s presentation on her Jane Austen collection, with a special look at her first edition of Lord Brabourne’s edition of Jane Austen’s letters. Edith is immensely entertaining at any time, but when I spoke at the iJane conference in Rochester earlier this year and mentioned the Brabourne edition, Edith told me afterwards that her first edition copy had once belonged to Anna Austen Lefroy’s daughter Louisa (I think I got that right) who added copious notes, family trees, information, and just plain gossip. For instance, she came right out and said that Warren Hastings fathered Eliza Hancock! It was at this breakout that I held the Jane Austen autograph, which was part of Edith’s collection AND SHE PASSED IT AROUND THE ROOM. Bless her. It was cut off a letter by Frank Austen and given to someone–not the Americans from this article, at least not as far as I can tell from the letter included with the autograph. But there it was–“Yours affectionately, J. Austen” and the date. It was a pretty special moment, as you might imagine. I then checked out a program about the ballet of “Beautifull Cassandra” that I blogged about a while back. Juliet McMaster talked about the genesis of her children’s illustrated version of the story, and Joanne Forman, the composer, spoke of her process of creating the music. A flautist and a harpist performed the music, which was sweet and whimsical and suited the piece very well as the piece was read and photos from the Taos Youth Ballet performance along with Juliet’s illustrations projected. Off to dinner–my friend (and AGM roommate) Lorna, Allison T., and I decided to try for deep-dish pizza that night, and we found out that two of our Eastern PA friends were going to Gino’s East, so I invited us along (wasn’t that nice of me?). Pizza and salad–pretty much my favorite meal. The pizza was good and did take a long time to bake! We were a little late getting back, but still caught most of the evening presentation with Stephanie Barron, Carrie Bebris, Jennifer S. Hunter, and Steve Martin discussing mysteries and Jane Austen, and how there are mysteries in just about all of her novels. And then off to bed to rest up for the longest, busiest day of the AGM! The AGM doesn’t really officially start until today, so yesterday was mostly extra events such as tours. I took the tour of Frank Lloyd Wright’s house and studio, and a walking tour through his Oak Park, Illinois neighborhood. What does Frank Lloyd Wright have to do with Jane Austen, you may be asking, and the answer is nothing at all. The tours recognize that most of us are visiting the host city for the first time and want to enjoy the cultural experiences. As we drove up to the house, I thought, “That’s the neatest house I’ve ever seen.” If you like Prairie School/Arts & Crafts/Craftsman architecture, it’s really beautiful. The house has been restored to be as close as they can determine to how it was when the Wright family lived there. I especially liked the dining room and the children’s play room. I’ll try to get some of my photos uploaded later. My friend (and AGM roommate) Lorna and I decided to search out Chicago deep-dish pizza but the waiting times at Pizzeria Uno and Pizzeria Due were both too long, so we ended up eating spicy Chinese rice bowls at Water Tower Place. Yum! We wanted to be sure we were in time for the “Curtain Raiser” event with Jeff Nigro of the Art Institute of Chicago, who spoke on “Visualizing Jane Austen and Jane Austen Visualizing.” He talked of our obsession (if you will) with knowing what Jane Austen looked like and our frustration with not really knowing, and also about visualizations, in illustrations and films, of her novels. It was interesting and thought-provoking, and we were delighted when he mentioned that the reason the Victorian prettied-up version of Cassandra’s drawing is used so often, even though many of us don’t like it, is because it is in the public domain. Cassandra’s sketch is not; it belongs to the National Portrait Gallery. Sometimes pragmatism must conquer! Then there was a reception, at which we met friends old and new. And then I fell into bed exhausted and ready to start all over again in the morning! I’ll try to post another report tonight and maybe some photos. In the meantime, I’ll be Twittering everything that happens! Entertainment Today has a preview with a schedule and information about each film in the series. Also there’s a new photo from Miss Austen Regrets. None of those folks would be associated with this blog, we believe. Denial is not just a river in Egypt, you know. PBS is positioning the series with educators, and has produced a Teacher’s Guide that might also be available to the non-teachers among us, and also has featured the series on its PBS Teachers website. (Thanks to Alert Janeite Diane for the link.) For the many students, both high school and university, who read AustenBlog, we would like to take this opportunity to remind you of JASNA’s 2008 essay contest, which incorporates the four new adaptations in the series, and has some pretty nice prizes, including free registration and two nights’ lodging for the 2008 JASNA AGM in Chicago.